As the successor to the Big Fish, The Race Pro 77 is the girthiest option in Movement’s Race Pro lineup, yet still has a head-scratching light weight. The Race Pro 77 is a full-blown mountaineering, corn-hunting, couloir-skiing tool that weighs less than some race skis. Movement uses a top-secret construction (using multi-axial carbon and Karuba) that allows them to achieve a surface-area-to-weight ratio that leaves most skis dreaming. With a relatively tight side-cut, the Race Pro 77 is a confident technical skinner which, if you’re not careful, offers enough confidence to get you into some trouble. Thank goodness that it's stable and true on the descent, so even if you get carried away, it’ll help get you out. A top-of-the-line P-Tex 5000 base is just about as high on the durometer scale as they come and will join arms with the Race Edges to stand up to rocky early and late season conditions. A welcomed bit of rocker helps the ski float well above what its waist width would suggest in soft or choppy snow. A tip notch accepts race tips so you can have the fastest transitions in the range. A gram counter’s powder ski? A mountaineer’s mainstay? A layman’s spring ski? Absolutely. Like an overweight race ski that’s graduated to higher speeds and deeper snow, the Movement Race Pro 77 is ready for more. Titanal reinforced binding mounting area for durability and longevity. Ultralight Karuba wood core is the method behind the madness. Race Edges are necessary for precise edging in steep terrain. P-Tex 5000 bases are durable and fast. Update 2018/19 - The tops of the skis will be looking a little different with a slightly updated graphic. I'm pretty much in love with these skis. Bought them last year and used them for everything but the deepest powder since. They get chattery and easy to catch an edge on hard groomers at high speeds (and what did I expect? ), but otherwise they are awesome for all kinds of variable conditions in the PNW from December through June. Plus I'm no longer last on the way up given how light they are! Super happy with these. do you have an ETA on the 174? If you're as much about the "earning" as you are the "turning," this ski should be your daily driver. I've used it in 2 feet of Cascade cement, refrozen crud, slush bumps, and plush corduroy. Every time, I feel like I made pretty good turns. For a ski that, in 174cm, only weighs 300g more than 160cm race skis, that's really impressive. Ascending 3000' an hour isn't hard on these skis. Basically, they add to your enjoyment on the way up, and barely detract from it on the way down. Might get you an extra lap, in which case they'd be adding to the enjoyment all the way around. 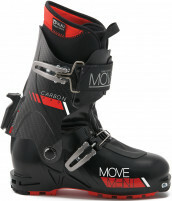 Would you recommend these for a light ski mountaineering setup for a small-statured skier? I'm 5'2 and 130lbs without gear. Transitioning from telemarks to AT and looking to save as much weight as possible to ski the PNW volcanoes in variable spring conditions. But if I can have fun with the same setup in the winter, that would be a plus! If not the right ski, what would you recommend? Hi Paulina, these are definitely a great ski for what you're describing! How much you will have on them in the winter will depend on your snow conditions, and level of comfort with a sub-80mm ski. I can tell you that I ski my skis of this dimension quite a bit in the winter. I like using them for steep, chalky couloir skiing in the winter, and then I stay on them through the spring and summer. There's a sticker on the skis saying to use a 3.5mm drill bit, but printed on the skis it says 4.1mm. Any idea which is correct? Hey Rob! I would recommend using a 3.5mm bit. That works well in our experience (even with the ones with metal in them). What are the major changes (if any) from the Big Fish? Would one notice the difference? Looking for something a bit wider and longer and than my PDG's and more suitable for touring, rather than a straight up race machine. I want to save my PDG's for raceday and training at resort. Hi Patrick, it's essentially the same ski. They redid the tip, dropping the "fish" personality, but it's the same shape with incremental manufacturing updates.